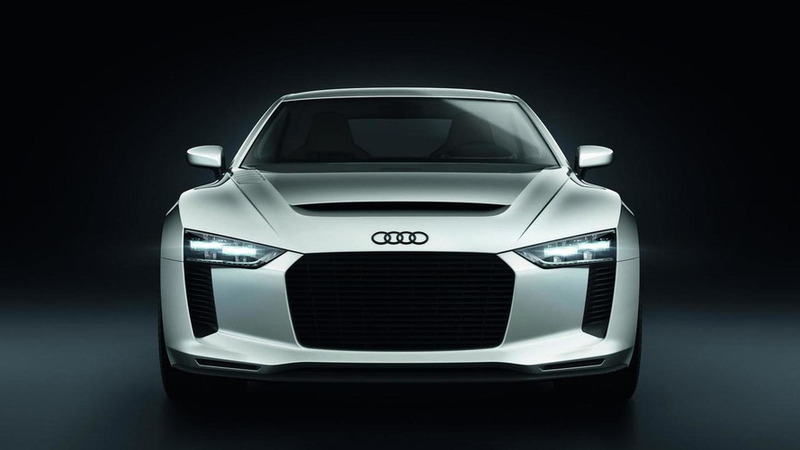 Audi has pulled the wraps of the stunning quattro concept which pays homage to thirty years of all-wheel drive. Audi has unveiled the quattro concept at the Paris Motor Show. Built to celebrate the 30th anniversary of quattro, the concept is based on the RS5 and measures 4.28m (14.04 ft) long, 1.86m (6.10 ft) wide, and 1.33m (4.36 ft) tall. It rides on a wheelbase that spans 2.60m (8.53 ft), which is 150mm (5.91 in) shorter than the donor car. Furthermore, the concept features knock-out styling with an aggressive front end, a carbon fiber diffuser, and center-locking 20-inch wheels. Unlike traditional Audis, the quattro concept has a rather plain interior. There's leather, of course, but everything is a no frills affair - on the surface at least. A closer inspection reveals a digital instrument cluster (which doubles as the MMI display) and an innovative multimedia system which can stream internet radio from your cellphone. Under the hood, power is provided by a turbocharged 2.5-liter five-cylinder engine with 300 kW (408 PS / 402 hp) and 480 Nm (354 lb-ft) of torque. It enables the 1,300 kilograms (2,866 lbs) coupe to accelerate from to 100 km/h in a staggering 3.9 seconds. As you've probably guessed, the concept also features the latest generation of quattro all-wheel drive. This particular setup has a crown-gear center differential which "can vary the distribution of power between the front and rear axles over a broad range, enabling the quattro drive system to react within milliseconds to coax the maximum of fun and safety out of every last bit of torque."